Runkeeper came out with a feature recently, where one can add a goal and the activities would be used to track the progress of achieving the goal. The goal can be a running distance goal, a racing achievement, or simply a weight loss target. 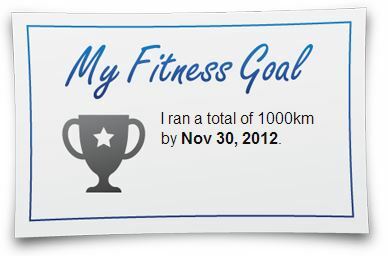 Since I have been running 8-9 km frequently in recent runs, I thought I should set a goal, to push myself. So I set myself to target a 10km distance completion, by end May. It turns out within a week, I accomplish my goal, albeit unexpectedly. On 4th April, I start with the intent to complete a 9km workout. Having ran through Mountbatten area in the previous run, I decide to stretch myself with a new route where I will run to Katong Park, before heading back via East Coast Park. I start the run a little too aggressive though, with the first km’s pace at 6.29min/km, and maintaining between 6.40min/km to 7.05min/km over the next 3km. I know this is not sustainable, so I begin to slow down my pace, but still average around 7.20min/km. By then, I am already running along East Coast Park, and the fresh air and park serenity help to keep the run going. By the time I reach the defunct East Coast Mc’Donald, I have covered 8km. I know if I were to run all the way home from here, I stand a very good chance of hitting the 10km mark! Cautiously, I slow down my pace in the 9th km, keeping at the pace of 7.38min/km. It is a calculated move that pays off. In the last 1km, I steadily and progressively increase my pace, averaging at 6.32min/km. The thoughts that I’ll be finishing the run and that I may reach my goal way in advance, motivates me to accelerate in the last km. Amazingly, by the time I reach the door step of my home, the distance covered is 10.01km! There you go, meeting my goal within a week of setting. The reality is up until now, I have never thought I will ever cover a 10km distance, certainly not with my condition 3 months ago. Achieving my goal, 4 weeks in advance! By now, I have completed 64 running activities, covering a distance 325.97km, since 15th Dec 2011. “Run for food” continues 🙂 Yaaaaaahooooo!